This reading was for a woman who, mid-career, lost her job due to a merger. She had been “comfortable” but not particularly challenged by the job. She had been with the company a long time, even though her position was below the level of her actual abilities. An initial impression of this spread is that it is fairly balanced, with emphasis on thought patterns due to the two Air cards (TRICKSTER and INTEGRATION). Note the absence of the Earth element, which we will consider later in the reading. 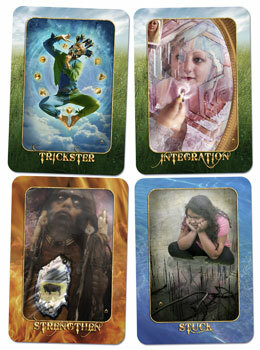 For now, it is clear that the four cards together give a powerful spiritual lesson. The TRICKSTER is the first card. Often, when things have been going along smoothly in life, we are caught unawares by a spiritual message trying to reach us. In this case, the woman took the loss of job very personally, as though she had failed. Yet the merger was beyond her control and the removal of her position was a calculated business decision, not a reflection of her failure. The spiritual lesson is that this woman is ready for a new, more challenging job—but the only way she would seek it was to have the rug pulled out from under her! The Trickster reminds us to remain humble and keep a light touch during life’s transitions. The artwork shows basic building blocks of life that we must return to time and time again. The Oracle councils this woman to stop berating herself mentally, and instead see the larger forces at work in her life. It’s time to see the benefits of challenging herself more, giving more from her areas of strength, and ramping up her efforts rather than simply cruising along. The INTEGRATION card further implies work that needs to be done around the idea of failure. The Oracle says it is time for a metaphysical makeover at work. Rather than simply jumping to a similar or lesser job than the one she just lost, she might investigate her assets and hone in on an area of work that she hasn’t explored but has often considered. At the heart of the reading is blockage, shown by the STUCK card. The woman was not expecting to be unemployed and had been quite comfortable in her work. But too much comfort is a way of being “stuck.” This woman is very smart and talented and had been working below her true ability. The universe gave her a much-needed nudge when she lost the job. The STRENGTHEN card is a call for inner focus and preparation. The woman will need to not only get her resumé and references in order, but dig in and knock on some new doors to expand her horizons. It will be important to keep her goal in sight, as indicated by the card’s artwork: a buffalo inside the hunter’s heart. Overall, the reading suggests a split or dichotomy, where two different realms of life have been in conflict – such as being in a job that didn’t really “fit,” or just going along for the ride — both of which contradict the woman’s true potential and ability. Finally, let’s return to the absence of an Earth element card, which relates to Body and material possessions. In this case, it’s a reminder to make sure mental worries and obsessions about failure don’t take a physical toll on health. The woman agreed that the real “failure” was not trying a job more suited to her true abilities and getting a little complacent. The reading helped her see how to promote herself out of negative thinking into a new, larger wholeness.